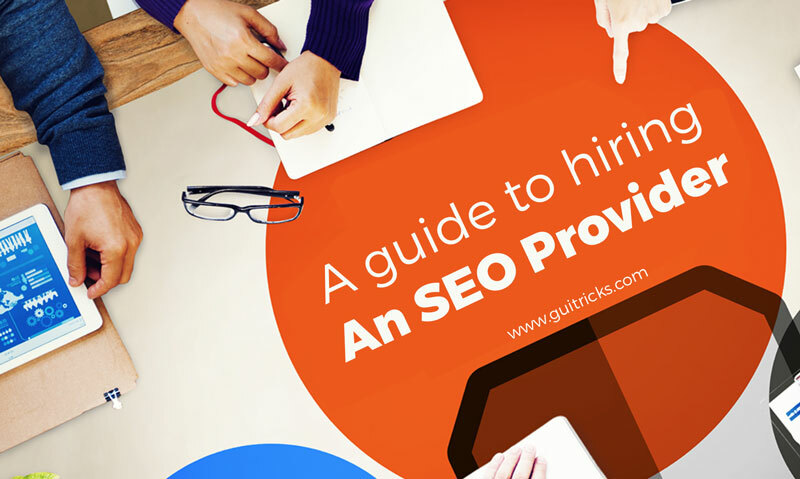 A Guide To Hiring An SEO Provider | GUI Tricks - In Touch With Tomorrow! A Guide To Hiring An SEO Provider - GUI Tricks - In Touch With Tomorrow! Search engine optimization is a digital marketing technique through which SEO professionals promote websites on all leading search engines and generate business out of that. In today's modern and heavily digitalized world, almost all entrepreneurs have gone online with websites, E-commerce portals, blogs, etc, to reach out the targeted audience easily and make a lot of business in a short duration of time. One must always keep in mind the success of a web-based business and income largely depends on the quality of SEO. They optimize your website for different search engines and ensure its good ranking in search results. To design informative and customer-centric infographics, templates, images, videos, etc. There are many SEO companies that take projects from clients and sent it to freelance SEO professionals to get the work done. So, while looking for an SEO company, you must look into the in-house infrastructure it owns. If possible, visit the office premises and see whether they have a sufficient workforce to handle your website optimization projects or not. Don't deal with an SEO company that outsources your project. Always choose an SEO company with proper in-house infrastructure. There are many ways of website optimization. In simple terms, there are broadly divided into two main sections- WHITEHAT SEO & BLACKHAT SEO. In Whitehat SEO practices, digital marketing professionals follow the website optimization guidelines, as prescribed by Google. It takes time to optimize websites and ensure its performance through this procedure. While doing Blackhat SEO, they violate the website optimization norms of Google to increase the SEO ranking of websites in search results and gain the unfair advantage over their competitors. If you continue the use of Blackhat SEO tricks to promote your website, Google may blacklist your site or erase it completely from its index. So, you must communicate different SEO companies on this topic and go for a firm that gives instant results with whitehat SEO practices. Always note that the availability of high-quality content is the basis of all digital marketing activities, such as content marketing, social media optimization, blogging, PPC ads, Guest blogging, etc. All these activities will automatically put on the hold if there is a shortage of the required content. Content creation, proofreading, and dispatching it to it the SEO company is a time-taking process. On several occasions, I fail to supply the required content to SEO professionals. It may affect the overall performance of your website and business opportunities you get. Therefore, you must choose an SEO firm that offers content writing services. This will keep you free from the burdensome and monotonous task of content writing. A good SEO firm must have several clients and customers. So, when you look for a suitable SEO firm for website optimization, just look at the reviews given by clients and customers. Check out their portfolio, how many clients they have served so far and what customers think of them. This will help you form an opinion about a particular SEO company and make a solid decision accordingly. Choose an SEO firm that has earned appreciation from its clients. Different SEO firms offer SEO services on different price tags. So, must have a separate budget for that. Some companies offer a wide range of SEO services at an exorbitant price. Some others limited SEO services with a low price. So, you must compare different SEO packages from all angles and choose a company that is ready to offer the maximum SEO services on the lowest possible expense. This will help you to save some bucks and get your optimized by the highly experienced and talented digital marketing professionals without any fuss. Most of the individuals create a website, upload content and expect lots of visitors from the day one. Usually, it doesn't happen. Even if you optimize websites with the latest SEO tricks, it takes time to show the effects (in terms of enhancement in website ranking on Google and other search engines, generation of leads/sales, a sharp increase in Newsletter subscribers, social media fans/followers). So, when you choose an SEO firm, just ask the business manager: when can you expect to get results out of their SEO exercises. Choose a company that is ready to offer results in maximum 2-3 months. 7. Do You Also Work With My Rival Company? Professional digital marketing companies have several projects for website optimization. They get these projects from different companies (that offer same products/services) with a sole intention to optimize websites and earn revenues (as referral amount as per website performance or fixed remuneration in accordance with the contract). When you choose an SEO firm, just investigate whether the company is working with your rival firm or not. If not, they go ahead with them. If yes, don’t make a contract with them as it will act as a "conflict of interest" and you might be losing a significant chunk of business. Uninterrupted Website optimization is an essential work for all those people who are involved in the web-based business. Some individuals hire SEO firms to do this job. By following the above-mentioned tips, they can easily pick a suitable SEO firm to perform the website optimization assignments in an easy way. Lauren McLaren was born and raised in Australia. She is working for Digital Muscle Limited, providing affordable SEO services Sydney, Australia. She’s hardworking, competent and trustworthy. Her role within the company is to design websites. In her spare time, she loves to read, cook and watch movies..